servitude, but most of all for blood. A story in the Storytelling Adventure System for the World of Darkness, inspired by World of Darkness: Dogs of War. 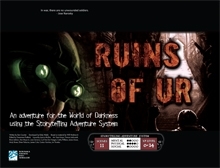 Ruins of Ur contains a number of hyperlinks to various portions of the text as well as bookmarks, so you can always jump right to what you need with just a click. Dogs of War is not required to run Ruins of Ur.